Latin America's troubles are largely driven by blunders in Brazil, the largest Latin American economy. Seen here: The skyline of Rio de Janeiro, Brazil. 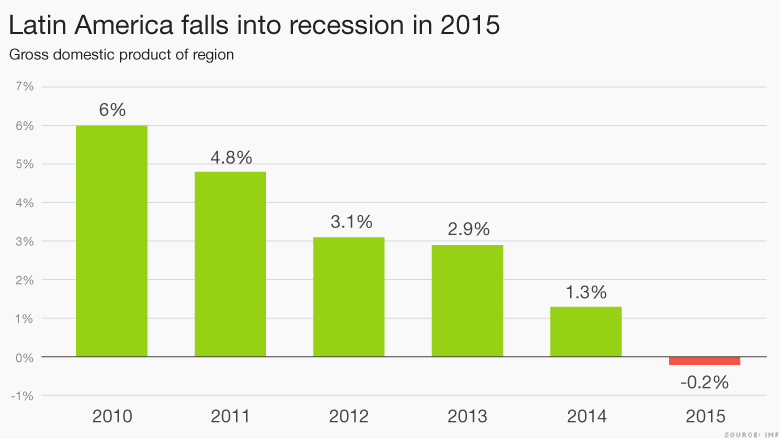 It's been a brutal year for Latin America. Barring a major last-minute rally, 2015 will be the worst year for the region since the global recession in 2009 when the economy in the region shrank 1.2%. And Latin America is arguably the worst performer this year among all developing regions too -- including Southeast Asia, the Middle East, sub-Saharan Africa and eastern Europe. 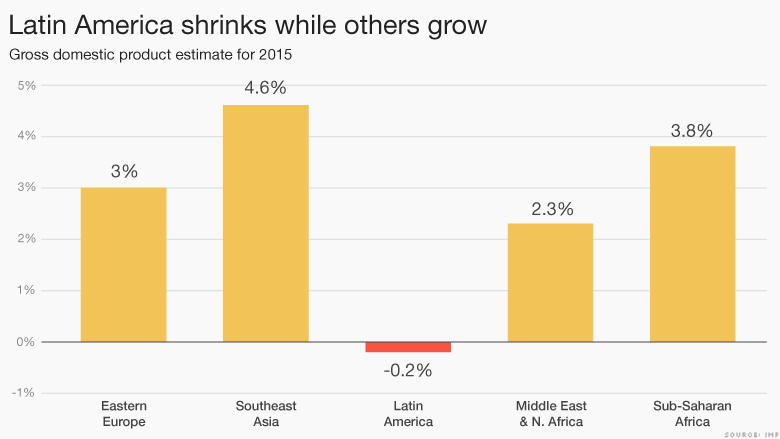 All those regions are expected to grow this year while Latin America's economy shrinks 0.2%, according to the IMF's estimates. The region's troubles are largely driven by blunders of Brazil, the largest Latin American economy and one that's deep in a recession. Brazil got its latest bout of bad news last week: inflation hit a 12-year high of 10%. Other gauges like manufacturing and consumer spending suggest its recession has only worsened this fall -- a gloomy sign for Latin America's overall growth. 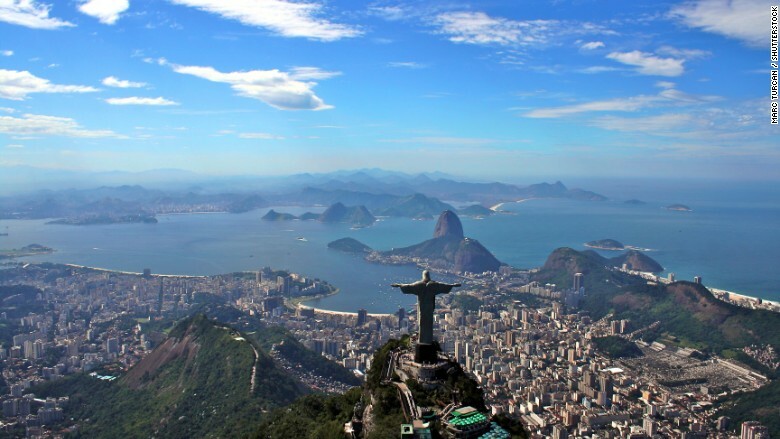 "Latin America is clearly the weakest [in emerging markets] and probably will continue to be in in the coming year," says Paul Christopher, head global market strategist at Wells Fargo Investment Institute. Other players aren't helping either. Venezuela too is in the midst of its worst recession in 70 years and Argentina is barely growing, partially because of its default over a decade ago and the fact that it hasn't resolved its problems with Wall Street hedge funds that own its debt. Brazil, Argentina and Venezuela make up half of the region's economy. Other countries like Colombia, Mexico, Chile and Peru have performed better. In fact, Mexico reported solid economic growth of 2.6% on Friday, slightly better than expectations. But Mexico and others have suffered from the slowdown in China's economy, which caused commodity prices for metals, food and oil to collapse. A decade ago, all of these countries benefited from China's economic boom and the subsequent rally in commodity prices. Latin America's struggles now are in part a failure by its governments to diversify their economies when times were good, says Christopher. Brazil epitomizes the region's hard times -- it has greatly increased its exports and dependence on China over the past decade. While its economy is more diverse than others, Brazil still relies heavily on commodities. Related: Will Argentina's next president negotiate with Wall Street 'vultures'? And as commodities prices started falling last year, Brazil's biggest corruption scandal began unraveling too. The ongoing investigation into the government-run oil company Petrobras caused Brazilians to demand an impeachment of President Dilma Rousseff. Rousseff has stayed in office, but investors have pulled out of Brazil -- the country's stock index, Bovespa, is down 3.7% this year. There's a couple of silver linings though. First, Argentina elected Mauricio Macri as its next president on Sunday. He's promised to pass major economic reforms and end Argentina's longstanding fight with Wall Street hedge funds. Second, the falling value of many Latin American currencies could make their exports more attractive. But it could be years before we see the benefits of cheaper currency take effect. Experts say the worst has already been realized and that next year will be better for Latin America -- but not by much. "The economy has turned down. It's hit the bottom. It's recovering [now] but growth is going to be depressed by past standards," says Neil Shearing, chief emerging markets economist at Capital Economics.